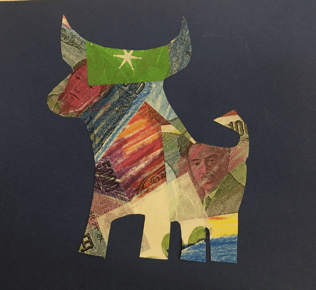 This week Adventures campers used rice paper and Xeroxes of Chinese, Japanese and Korean money to create collages based on the animal zodiac signs. This is the Year of the Dog. Our Discoveries campers were excited to craft their way through Asia. We learned about several Asian countries and created Japanese cherry blossom trees, Chinese New Year Dragons, Rangoli inspired Mandalas and more! This week, campers explored different symbols of the countries in North America. Campers learned the shapes of the American flags and The United States National bird with Handprint bald eagles. Campers also learned about our neighbors to the north and made watercolor Canadian flags and paper bag beaver puppets! Discoveries Campers, Budding Art Critics! 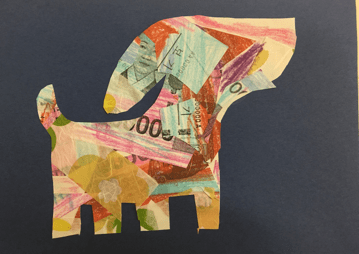 For the week of July 25, our Discoveries campers will be introduced to great artists Pablo Picasso, Barnett Newman, Robert Motherwell and Jackson Pollack, to name a few, and they will be encouraged to appreciate art through the perspective of an art critic. In addition, campers will work on self portraits as they study vertical and horizontal lines in their artwork! During the week of July 18 our Discoveries campers will be introduced to contemporary and impressionist artists like Picasso, Matisse, Vincent van Gogh and MANY more! Inspired by our Olympics theme this summer, we will also read Element of Art: Texture and Perspective and learn about art from other countries and cultures, including Aboriginal art, art made by indigenous Australian people. Painting with water then seeing where our cool colors go to revisit seascapes.